Do you need to identify your dog's activity? 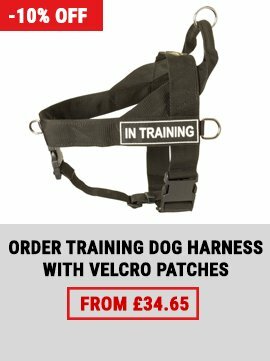 A harness with patches will help you! There are two the most functional harnesses with sign patches to your choice. They are made of tear, stretch and water-resistant nylon and are suitable for a variety of dog activities. 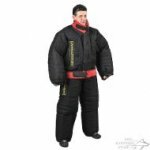 The first model is a multifunctional gear, which is used for walking, training, sport, service work and pulling. It is light-weighted and extremely durable. The harness consists of wide and strong nylon straps. They are reliably stitched. Stitches are straight and fine. 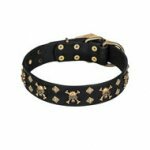 Girth and under belly straps are adjustable to fit the harness to your dog's sizes perfectly. Under belly strap is removable. 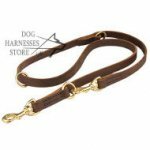 It serves for better harness functionality and dog comfort during pulling work. You can always remove it with the help of quick-release buckle. There are ID patches on both sides. They are attached to the harness on Velcro. Letters of light color are highly visible on black background in any light conditions. There are various signs on the patches and you can choose a pair of suitable ones. The harness is equipped with four welded rings of rust-resistant and solid nickel-plated steel. Two side D-rings serve for muscles building. 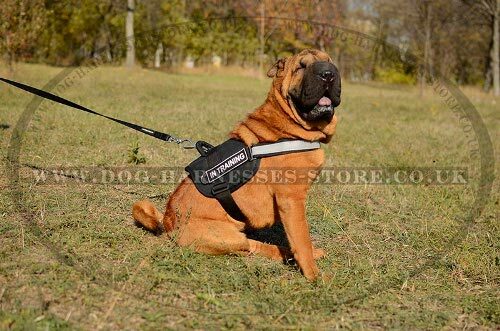 The D-ring on the chest strap will help to stop dog pulling gently and naturally. The dog will be guided towards you when it pulls on the lead without harmless pressure on its neck and throat. Floating O-ring on the handle is also for leash fastening. The handle is strong, but safe and convenient to hold. This harness is easily worn. 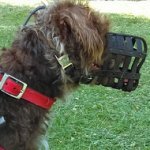 It is quick-detach buckle to make dog harnessing effortless. The buckles are of molded plastic. They are firm and handy in use. 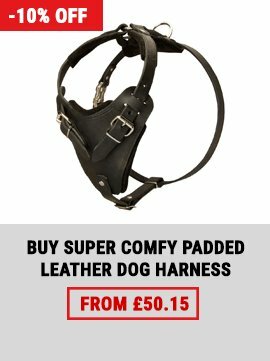 The harness is excellent equipment for everyday use! The second model will make your dog noticeable in the dark. 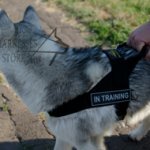 There is a reflective tape on the chest strap that allows handling the pet safely at night time. 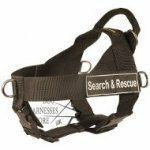 This harness is used for any activity from everyday walking to K9, police and SAR work. The harness is also suitable for pulling work and physical development. 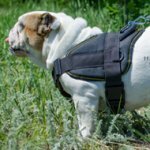 Dog harness Velcro patches will show a kind of your four-legged friend activity. Ultra light weight of the harness makes it very comfy for the dog. Convenient design together with ergonomic upper handle provides full control of the canine. 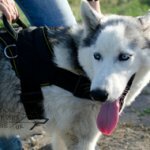 Broad nylon straps are firm and safe for dog's skin. They won't rub or cut into it. Belly strap is adjusted. The harness is finely sewed for extra strength and fitted with three welded D-rings of steel with nickel plating. They won't break or get rusty with time. 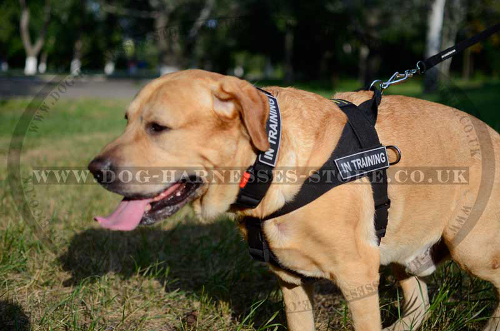 Side D-rings are for cargo attachment during physical training and the one on the back plate is for leash. 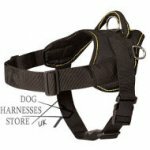 Large back plate makes the harness maximum comfortable. 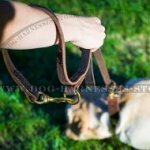 Quick-release plastic buckle saves your time and helps to put the harness on the dog within seconds. 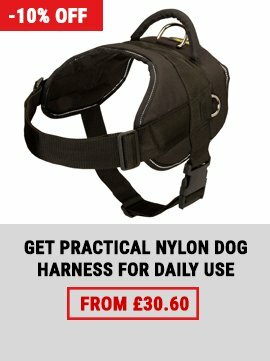 This harness is perfect for daily activities of your dog! 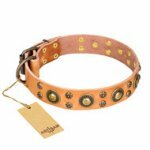 Beige Leather Dog Collar by FDT Artisan "Sophisticated Glamor"